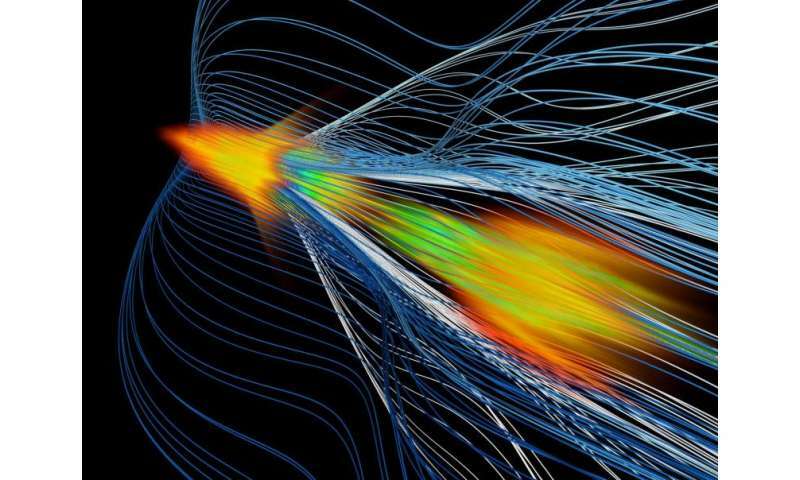 The scientists had previously shown that boosting the energy of charged particles by having them "surf" a wave of ionized gas, or plasma, works well for electrons. While this method by itself could lead to smaller accelerators, electrons are only half the equation for future colliders. Now the researchers have hit another milestone by applying the technique to positrons at SLAC's Facility for Advanced Accelerator Experimental Tests (FACET), a DOE Office of Science User Facility. "Together with our previous achievement, the new study is a very important step toward making smaller, less expensive next-generation electron-positron colliders," said SLAC's Mark Hogan, co-author of the study published today in Nature. "FACET is the only place in the world where we can accelerate positrons and electrons with this method." SLAC Director Chi-Chang Kao said, "Our researchers have played an instrumental role in advancing the field of plasma-based accelerators since the 1990s. The recent results are a major accomplishment for the lab, which continues to take accelerator science and technology to the next level." Researchers study matter's fundamental components and the forces between them by smashing highly energetic particle beams into one another. Collisions between electrons and positrons are especially appealing, because unlike the protons being collided at CERN's Large Hadron Collider - where the Higgs boson was discovered in 2012 - these particles aren't made of smaller constituent parts. "These collisions are simpler and easier to study," said SLAC's Michael Peskin, a theoretical physicist not involved in the study. "Also, new, exotic particles would be produced at roughly the same rate as known particles; at the LHC they are a billion times more rare." However, current technology to build electron-positron colliders for next-generation experiments would require accelerators that are tens of kilometers long. Plasma wakefield acceleration is one way researchers hope to build shorter, more economical accelerators. Previous work showed that the method works efficiently for electrons: When one of FACET's tightly focused bundles of electrons enters an ionized gas, it creates a plasma "wake" that researchers use to accelerate a trailing second electron bunch. For positrons - the other required particle ingredient for electron-positron colliders - plasma wakefield acceleration is much more challenging. In fact, many scientists believed that no matter where a trailing positron bunch was placed in a wake, it would lose its compact, focused shape or even slow down. "Our key breakthrough was to find a new regime that lets us accelerate positrons in plasmas efficiently," said study co-author Chandrashekhar Joshi from UCLA. 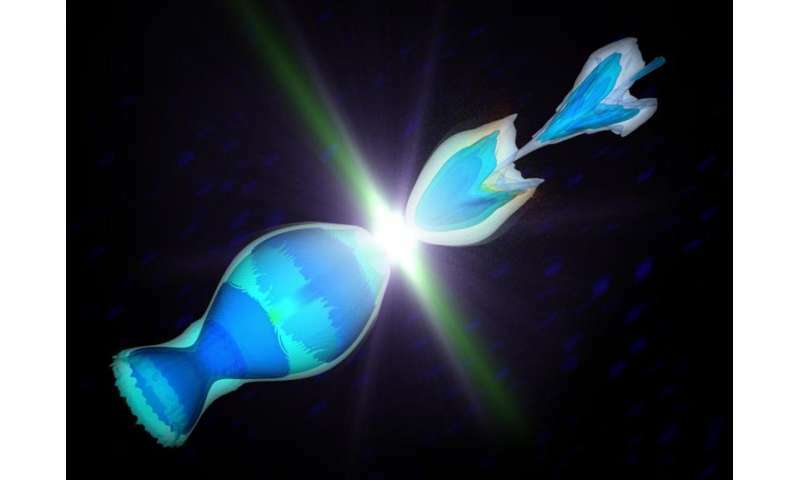 Instead of using two separate particle bunches - one to create a wake and the other to surf it - the team discovered that a single positron bunch can interact with the plasma in such a way that the front of it generates a wake that both accelerates and focuses its trailing end. This occurs after the positrons have traveled about four inches through the plasma. "In this stable state, about 1 billion positrons gained 5 billion electronvolts of energy over a short distance of only 1.3 meters," said former SLAC researcher Sébastien Corde, the study's first author, who is now at the Ecole Polytechnique in France. "They also did so very efficiently and uniformly, resulting in an accelerated bunch with a well-defined energy." All of these properties are important qualities for particle beams in accelerators. In the next step, the team will look to further improve their experiment. "We performed simulations to understand how the stable state was created," said co-author Warren Mori of UCLA. "Based on this understanding, we can now use simulations to look for ways of exciting suitable wakes in an improved, more controlled way. This will lead to ideas for future experiments." Although plasma-based particle colliders will not be built in the near future, the method could be used to upgrade existing accelerators much sooner. "It's conceivable to boost the performance of linear accelerators by adding a very short plasma accelerator at the end," Corde said. "This would multiply the accelerator's energy without making the entire structure significantly longer." I wonder if there is any possibilities of using technology in rocketry in the future? Like the title, calling Protons, Positrons. Excellent beginning! How did you define causality?